Military history stretching back more than 1,000 years has been marked with a formal farewell to the 1st Battalion the Parachute Regiment in Dover. The regiment is leaving the Connaught Barracks in the town and moving to a new home in St Athan, south Wales. Eighty five soldiers and members of the Parachute Regiment Band paraded through Dover alongside a convoy of army vehicles on Friday. A farewell salute at the town hall was followed by a special reception. Councillor Pat Heath, chairman of the district council, made a presentation to the regiment on behalf of Dover. Mr Heath said the departure was "not the best idea", after 1,000 years of having a garrison "protecting the gateway to Europe". Brigadier James Plastow, Commander of 2 Infantry Brigade, argued: "We're long past the days where we've needed to have troops on the beach. We defend our country in other ways now." The history of the Connaught Barracks dates back to 1861, when the first defences at Fort Burgoyne were built. 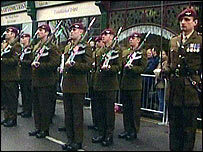 The 1st Battalion the Parachute Regiment arrived in Dover in 2000 and has since seen service in Northern Ireland, Iraq and Sierra Leone. The Connaught Barracks will be passed over to Defence Estates, an executive agency of the Ministry of Defence, which will then look to sell off the land. Some of the Gurkha families normally based at Shorncliffe, near Folkestone, will be housed in quarters adjacent to the barracks.